Happy Hump Day my friends! So I finally took the plunge and jumped on the Stitch Fix wagon. I'm sure most of you are already familiar with the online service, but if not, now you will be! 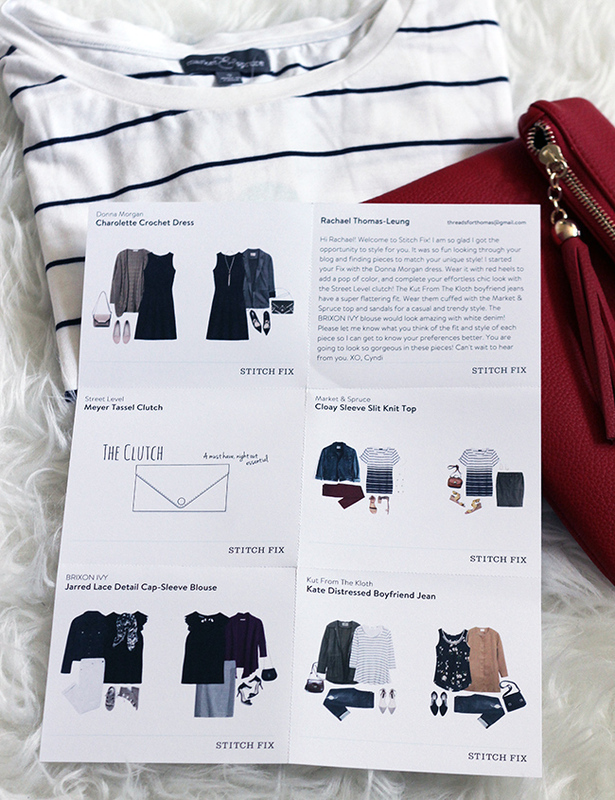 Stitch Fix is a clothing subscription service, where items are picked out based upon your style preferences, and delivered right to your door step. A lot of customers end up choosing a monthly subscription, as I did, but you have the option to choose how often or little you'd like deliveries. Upon signing up, you are asked questions about your style, then assigned a stylist who picks out five items per shipment to send you. You have three days to try on the clothes and decide what you want to keep or send back. This is the best part about the service, since you are able to do this in the comfort of your own home. You simply keep what you want, and send the rest back in the prepaid shopping bag that is provided. There is a styling fee with each box of $20, however, if you decide to purchase items from your box, then the $20 is put towards your purchase. And if you decide to keep all 5 items, then you get a 25% discount! I have to say that I was very pleased with the items that my stylist, Cyndi, sent, and today I'm sharing three of the five items that were in my box. The first is this Brixon Ivy lace detailed blouse. I love the cap sleeve style, and the lace detail is so pretty, especially on the back. It's a piece that can easily be dressed up for special occasion, but I decided to pair it with these Kut From The Cloth boyfriend jeans which were also in my box. You all know how much I love my denim, and boyfriends are my go-to style for the summer since they are comfortable on a hot day, so I was happy to see that these were included. 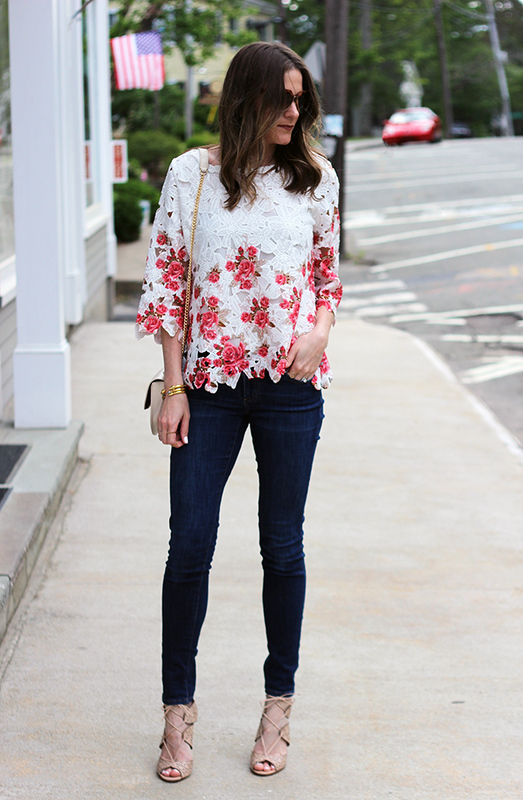 I decided to dress up my boyfriend jeans by pairing them with the lace top, and a fun pair of heels. 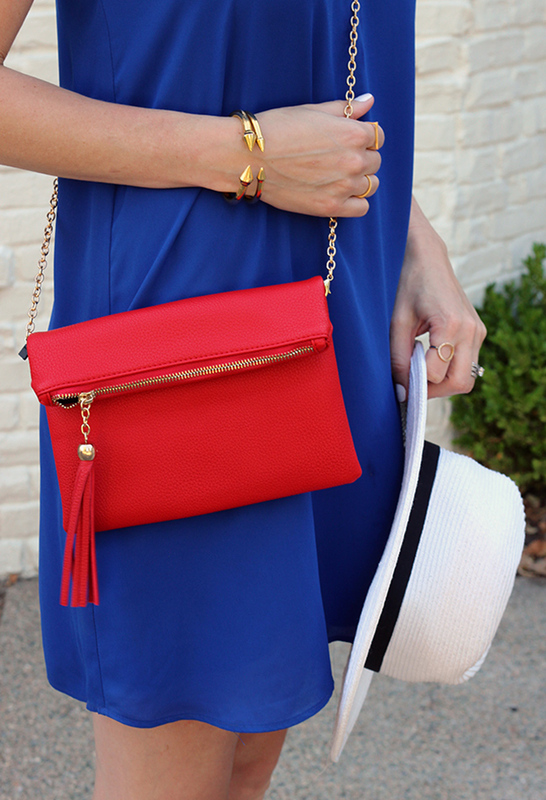 I finished my look with this Street Style red clutch, the third item that was in my box, for a fun pop of color. 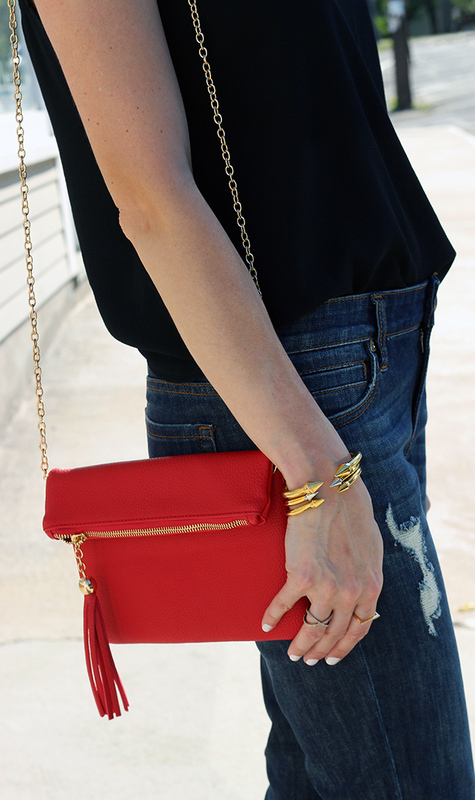 The chain strap is removable so you have the option of wearing it as a clutch or cross body. I'd say it's the perfect look for grabbing drinks with the girls. Included in your box is a card with suggestions on how to style each piece. Such a clever idea! 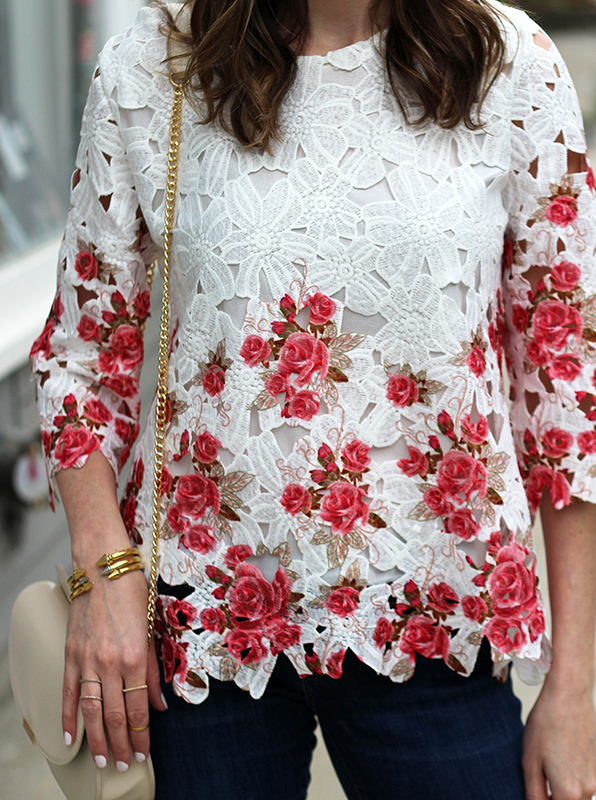 Loving the lace detail on this blouse. Above are the five items that were in my box. On Friday, I'll be sharing a second look that I styled with these pieces, along with an update of which items made the cut. So make sure to stop back to find out! 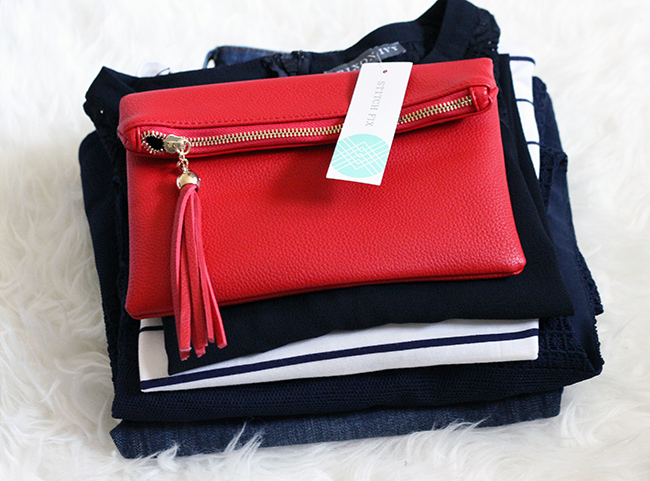 Want to try Stitch Fix for yourself? You can sign up below. 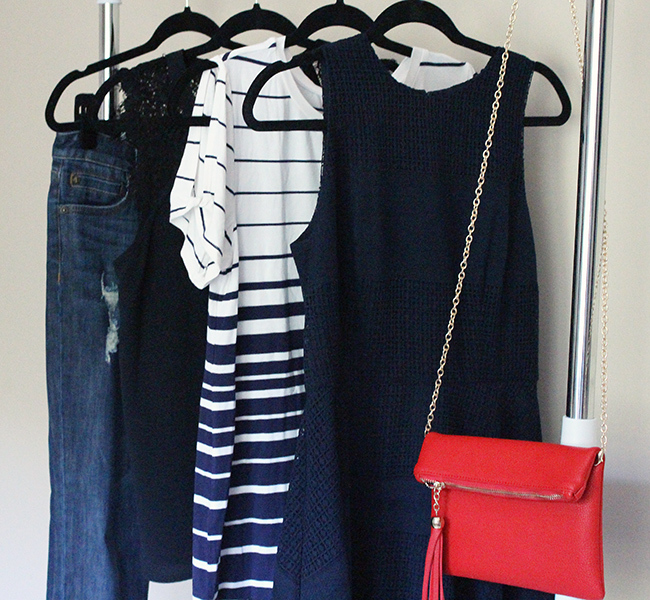 Linking up with these amazing blog here. 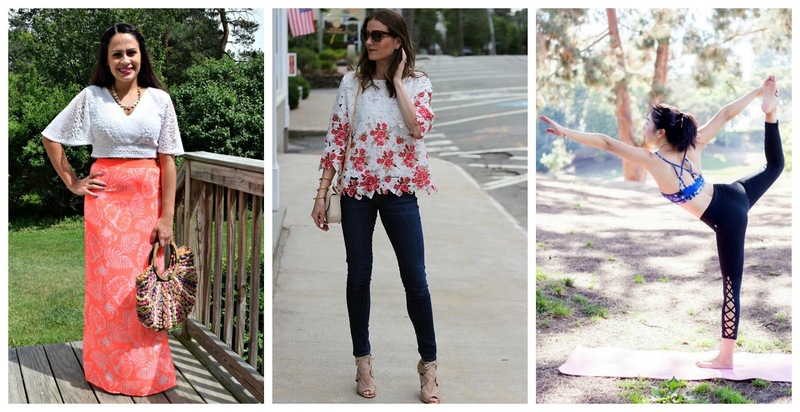 Thank you to Stitch Fix for partnering with me in this post. All thoughts and opinions are my own. 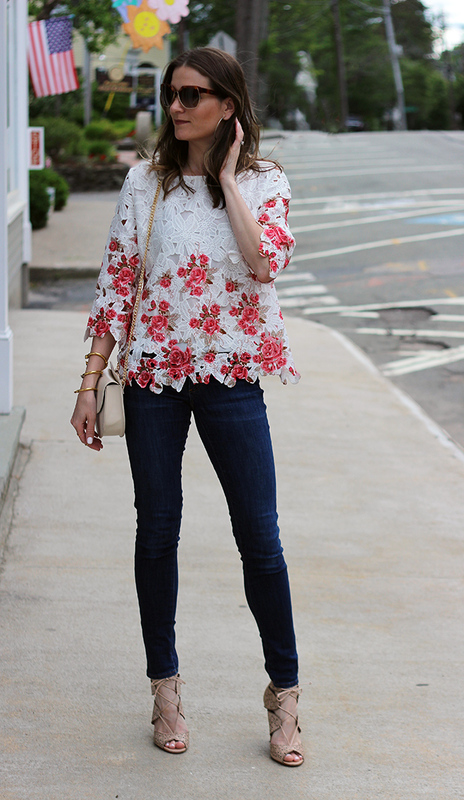 I'm obsessed with this lace blouse. Okay, a bit of my geeky side coming out for you on this Friday morning, but there is just something about Fridays that put me in a silly mood. I know it's the beginning of the weekend, but lets be honest, as a stay at home mom it's not like my life is any different on these two days. Maybe it's the fact that I can drink as much wine as I want and not feel guilty about it (JK, but not really). Anyway, remember when I mentioned that I had a little obsession with lace this summer? 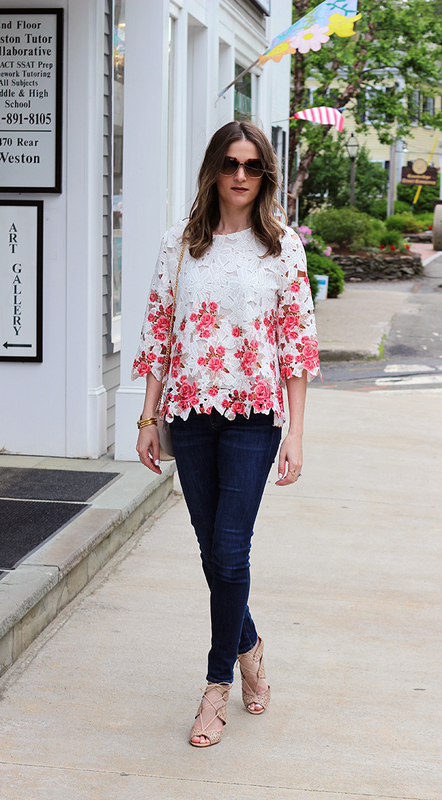 Well I wasn't kidding, and this roses lace top is currently my favorite. I mean, how gorgeous is the rose print and lace detail? Because of the slight boxy fit, I paired it with skinny jeans, and my lace heels to balance out the look. However, I'm thinking this top will also look great with my my white denim shorts and a pair of wedges. The feature blogger of the week is Ashleigh from 21st and Main. 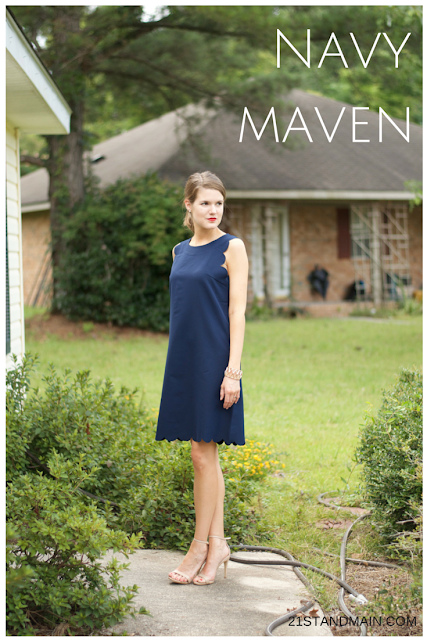 How gorgeous is her scalloped navy dress? Make sure to visit her blog and say hello! Happy first day of summer! Did everyone have a great weekend and Father's day? I had the perfect weekend for ringing in the official start to the season. The boys and I were up at the lake celebrating my niece's graduation from pre-school, and couldn't of asked for better weather. It was a weekend filled with swimming, barbecues, boat rides, and bonfires, and I can't wait to have many more similar weekends in the days to come. 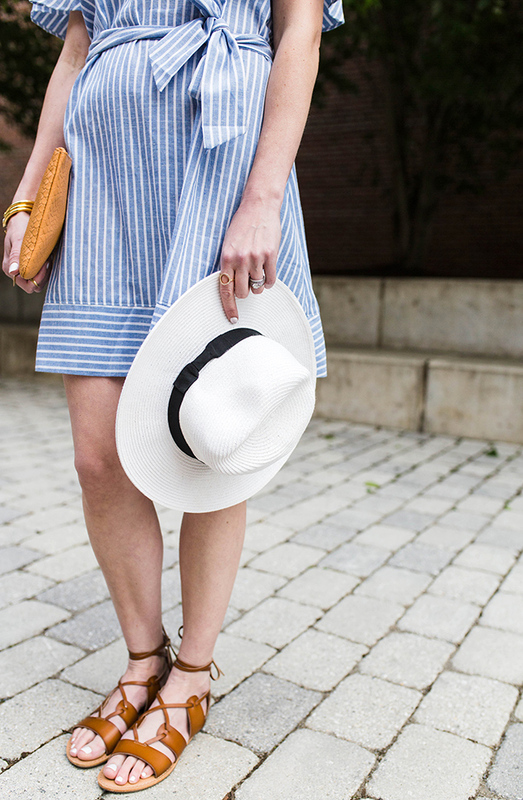 Speaking of, isn't this ruffled stripe dress the perfect piece for summer? I wore it this past weekend to the graduation, and think it will also be a great option for the 4th of July. 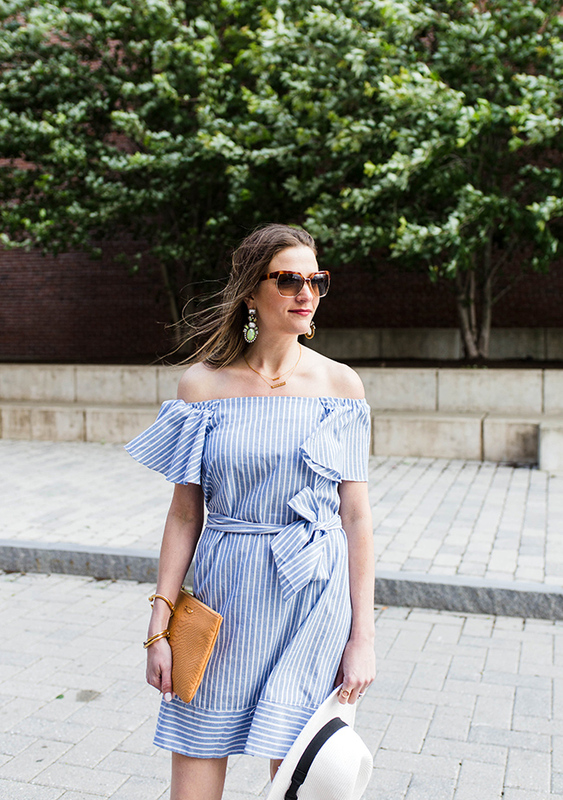 You all know I'm a sucker for off the shoulder dresses, but the blue and white stripes along with the ruffled sleeves really make the dress. For an easy summer look, I paired it with my gladiator sandals and a white panama hat, then finished my look with this melon clutch, which I loved against the white and blue of the dress. By the way, I'm loving these photos! The other week, I had the opportunity of working with Laura of LCS Studio, and couldn't be happier with the way they turned out. She also took my photos in last Friday's post (here) which I'm obsessed with. It was SO windy the day of our shoot, and lets just say my dress did not want to cooperate with the wind. Even so, she managed to capture some great shots. If you live in the Boston area, I highly recommend checking out her photography.